Great. 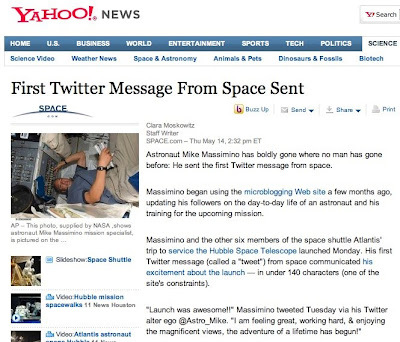 Dude, you’re in space and you can’t fill the 140 characters? Is space as boring as everything else people twitter about? Here’s another one he sent: “Enjoying the magnificent views.” Are you orbiting the earth, or with my mom on an Alaskan cruise? So space is as boring as everything else someone twitters about?